This vegetarian grilled corn soup is perfect for summer! Veggie based with tons of flavor and color! I am one of a small group of people who are happy it’s unseasonably cool in the summer (Mr. B is not in this group). After the very ridiculous winter we had in Chicago (and that many other areas also suffered), I thought I would be ready for 90 degrees. Alas, I am a delicate flower that wilts in the heat. Yesterday’s heat and humidity made me miserable – spring and fall are much more my cup of tea. The day I made this the temps started off in the 60’s and when I realized it was cool again, I raced to open the windows and turn off the air conditioning. I decided to take advantage of the unseasonably cool July weather and make soup. 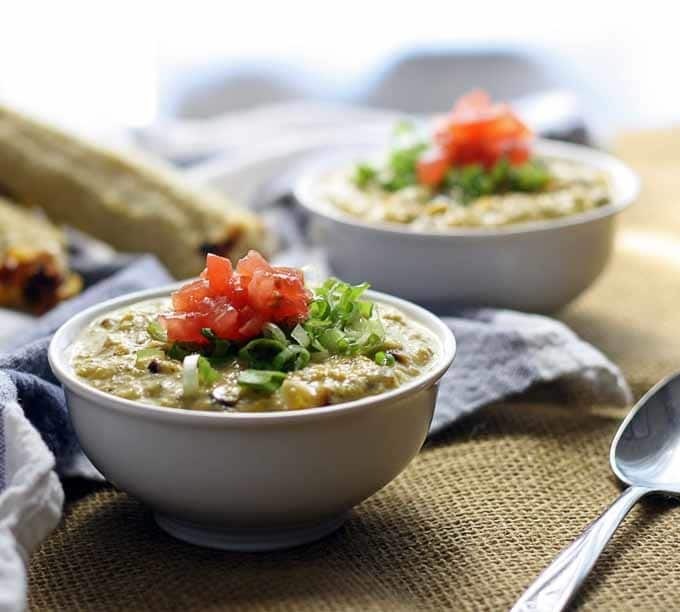 Soup in July… sounds like a dream. And this is my dream come true! Haha. I enjoyed the corn and bacon dish I made so much a few weeks ago that I decided to make a corn soup. Why not? I asked Mr. B. to grill up some corn and veggies for me while he was making some burgers, and then I got to work. Remember that grilling cookbook (affiliate link) I told you about a few weeks ago? 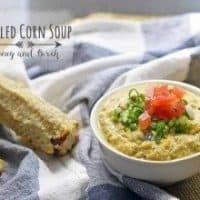 Well, I found a corn soup recipe in there that was perfect for my craving. I did have to modify it a little bit – I couldn’t find all of the ingredients at the store and I chose to use some stuff I had on hand instead of buying what was in the recipe. I’m sure you’ve been there. But the key ingredient – grilled corn – stays the same. I have no idea what the original recipe should taste like, but this baby is delicious! We start with 4 ears of corn and two peppers – a yellow bell pepper and a poblano. After you oil them up, put them all on the grill. When there’s a little char on everything, remove them from the grill and immediately cover the peppers with foil. This is going to contain the heat in the foil and steam the skins a bit so that they are easier to remove. Set the foil covered peppers aside, and the corn ears too – if the ears cool off a bit they will be easier to handle. After about 10 minutes, remove the foil and use a paring knife (or any other sharp knife) to remove the skin from both peppers. You won’t need the skin so either toss it out or put it aside for another recipe (if you have a recipe for charred pepper skin, send it my way!!). Cut the peppers in half and remove the seeds. I decided we needed a little kick to our soup so I left a few of the poblano pepper seeds, but that’s totally not necessary. Throw half of each pepper and the corn from 2 ears into a blender with the vegetable broth. Puree everything until it is really smooth. 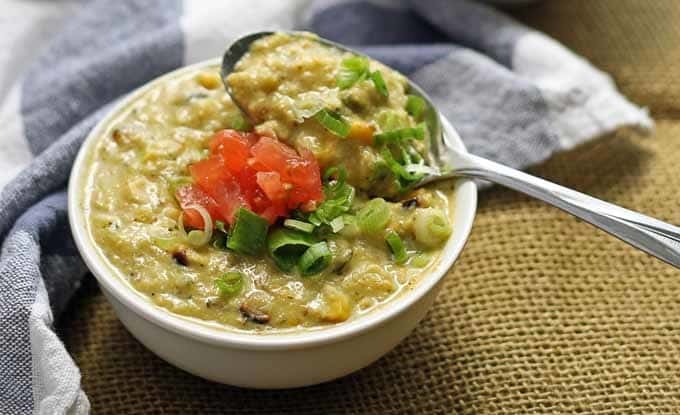 Then combine the corn puree in a pot with the remaining corn and peppers. Bring this to a boil, remove from heat and add the half and half and the salt and pepper (lots of ands there). Thanks to the vegetable puree, this soup has a thickness to it that reminds me of a cream based soup. I guess it kind of is one, because of the half and half, but there’s such a small amount of it that I don’t think it counts. If you like your soup thinner, add more vegetable broth – Mr. B said it reminds him of soupy cream corn. We topped the soup with fresh diced tomatoes and green onions and proceeded to devour it. It makes about 4 portions, and next time I make it I will probably double the recipe. 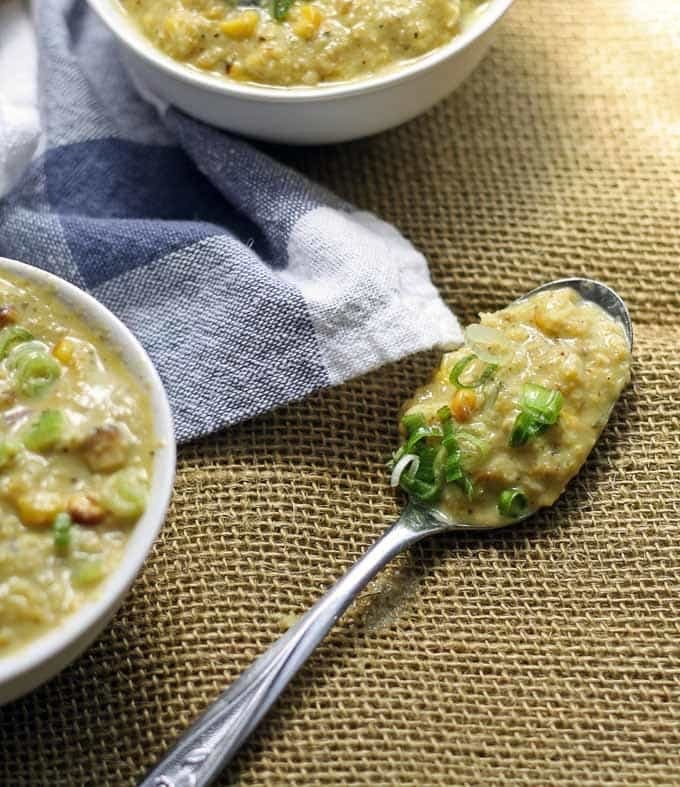 I’d love leftovers of this soup and its pretty easy to make. Brush the corn and peppers with the vegetable oil. Grill them until the corn is tender and the peppers are charred on all sides. Set the corn aside and wrap the peppers tightly in foil. Wait 10 minutes and then remove the skins from the peppers with a sharp knife. Remove the seeds and cut the pepper in half. Cut the corn kernels from the cobs. Add 1/2 the corn and 1/2 of each pepper to a blender with the vegetable broth. Puree until smooth. Dice the remaining peppers into 1/2 inch pieces. 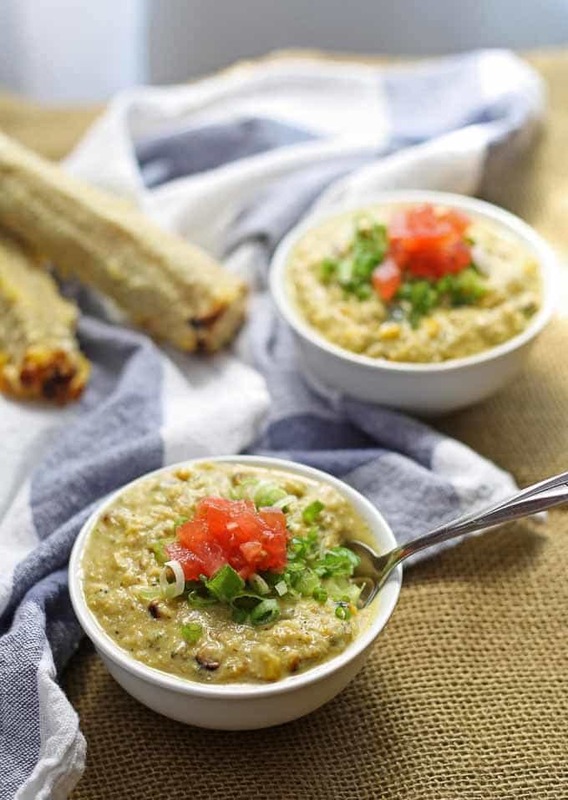 In a saucepan, add the corn puree, the remaining corn and peppers, and the adobo seasoning. Bring to a boil. Stir frequently. Remove from heat and add the half and half. Season to taste with salt and pepper. Garnish with tomato and green onion when served. 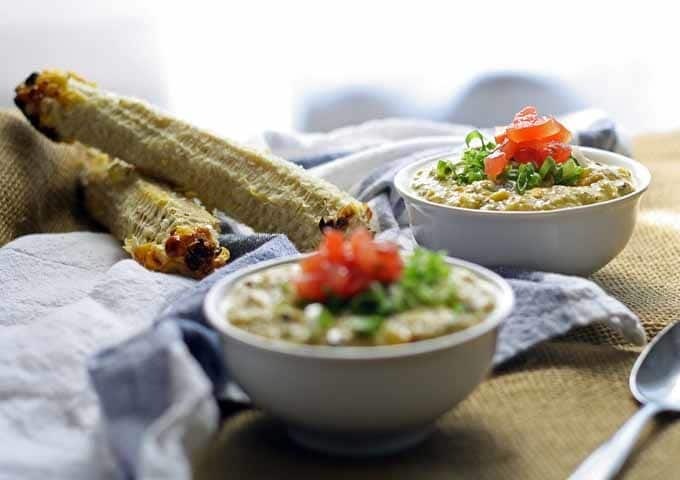 Looking for more corn recipes? Try roasted cream corn with bacon or this buttermilk duck fat cornbread! OMG this sounds so good. Thank you for sharing with us! This looks AWESOME. Def a must try. I’m just going to move in with you! LOL This honestly sounds A-MAZING! 🙂 YUM! I bet the poblano pepper gives this amazing flavor. Looks like my kinda soup! 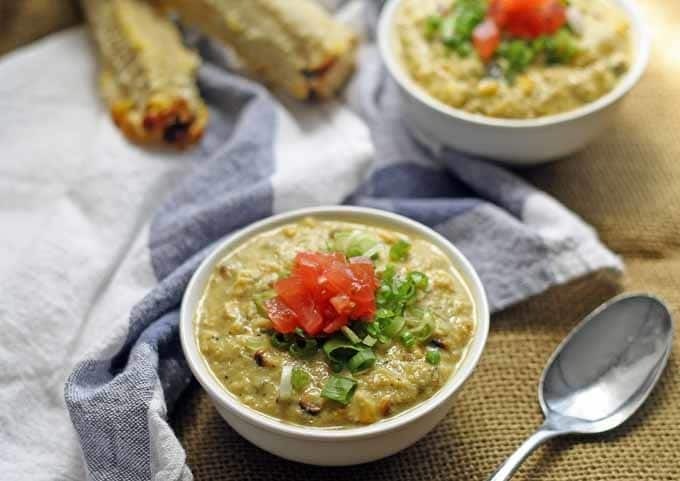 Thanks Amy – the poblano definitely gives some depth to the soup! 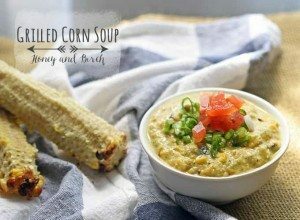 I love grilled corn anything, so this soup looks absolutely heavenly, and is certainly one that I will be trying. This looks amazing. I have a bunch of corn on the cob that I need to use in my freezer, so we will try this! Thanks for linking up to This is How We Roll linky party!